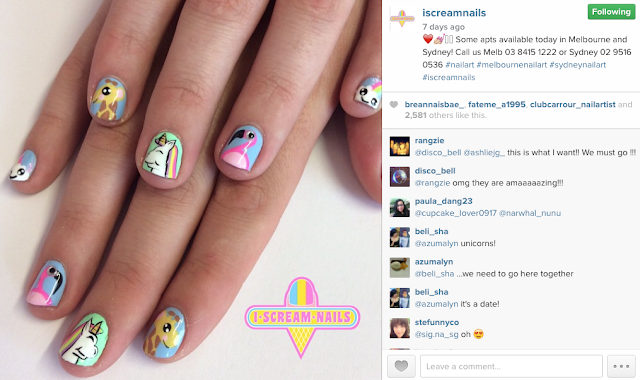 One of my new favourite IG accounts to stalk is I Scream Nails. They're a nail bar in Australia, and pretty much the coolest place ever. Their designs are bright, cartoon-y, and super mega fun, which is why I'm sure you're not surprised with my obsession. Haha! Last week, I saw the cutest little flamingo, and since I literally live on the other side of the globe and therefore can't make an appointment, I decided to give it a try, myself. So cute, right? I mean, it's pretty much ALL the cute. Haha! Those legs! I love how it all came together. To ease into the design, I started with the clouds (which were also from the I Scream Nails account, but on a different mani), after two coats of UV Meant To Be that had dried completely. Surprisingly, they were pretty easy to do. I used two differently-sized dotting tools to make one larger and one smaller cloud per nail. 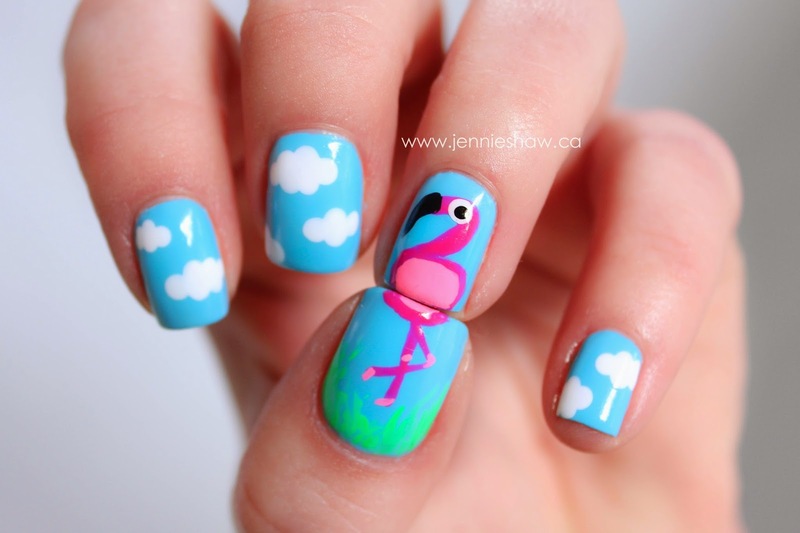 For the flamingo, I used a thin, narrow nail art brush and Escaping Reality to outline the flamingo. First, I drew a semi-circle for the body, and then curved upwards in a "S" shape, for the neck and head. Using that as a guide, I thickened his face/neck, and filled in the other colours. For the beak, I used Black Rite Stripe. For the bottom of the flamingo, I did a similar outlining technique, starting with the body, and then adding the legs. When I'd finished, I thought the bottom nail looked a bit empty, so I added the grass. I seriously cannot even handle how cute he turned out. I've longed for an I Scream Nails flamingo and although I had to do it myself, I'm so happy I did. And the clouds are freaking adorable. I've gotten more compliments on this mani than I know what to do with. 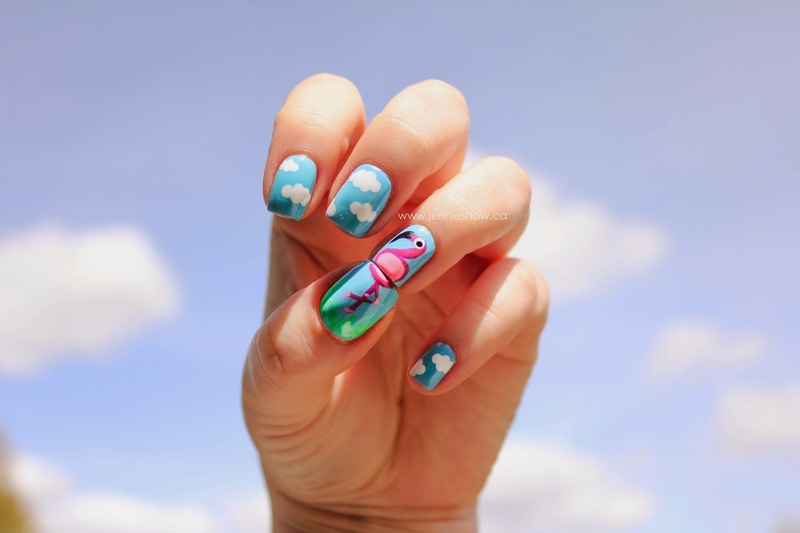 I couldn't resist this last shot--nail art clouds with real ones! Haha! What were you rocking this week? And here's a question, Kimberlee suggested that maybe we should have a themed nail files week! Would you be interested in that? Sometimes it's hard to get inspired, so having a prompt could help. Leave a comment with suggestions on what you'd like to see, and heck, if there's a bunch of ideas, we'll do a few! Let me know if you're game! In the meantime, don't forget to link up and have an awesome weekend! Love the clouds. Ours have been looking like that lately. I cannot get over how well it came out! Your flamingo looks perfect, and totally like a flamingo. YAY! And I would love to have a theme week, or month, or something. I'm usually in desperate need of some guardrails on my mani desires. As for themes...hrm....Cinco de Mayo? May flowers? Wedding season? Maybe a country or animal theme? Jennie you da best, you da you da best. Love your flamingo, and the clouds. And day-um what a colorful line-up of polishes! !